As Good to Great author Jim Collins writes in his foreword, this book offers "a detailed roadmap of disciplined thought and action for turning a good nonprofit into one that can achieve great impact at scale." 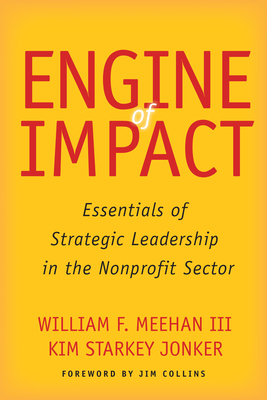 William F. Meehan III and Kim Starkey Jonker identify seven essential components of strategic leadership that set high-achieving organizations apart from the rest of the nonprofit sector. Together, these components form an "engine of impact"--a system that organizations must build, tune, and fuel if they hope to make a real difference in the world. By offering crucial insights on the fundamentals of nonprofit management, this book will help leaders equip their organizations to fire on all cylinders and unleash the full potential of the nonprofit sector. Visit www.engineofimpact.org for additional information. William F. Meehan III is the Lafayette Partners Lecturer in Strategic Management at the Stanford University Graduate School of Business and a Director Emeritus of McKinsey & Company. Kim Starkey Jonker is President and CEO of King Philanthropies, Lecturer in Management at the Stanford Graduate School of Business, and the former Executive Director of the Henry R. Kravis Prize in Nonprofit Leadership. Together, they co-authored the popular Stanford Social Innovation Review series, "Fundamentals, Not Fads."